From left: MBF Executive Director Beth Lynch, Attorney General Coakley, Past President Laurence Johnson, President Joseph Vrabel, Vice President Jerry Cohen, Treasurer Robert Ward Jr., and me. I am honored to report that at the annual meeting of the Massachusetts Bar Foundation on Jan. 25, I was elected MBF secretary. The MBF is the state’s premiere legal charity, committed to ensuring equal access to the legal system for all, particularly those most vulnerable and in need. 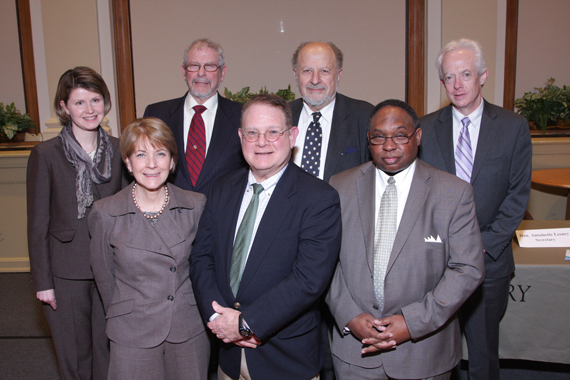 Also at the annual meeting, the MBF presented Attorney General Martha Coakley with its 2011 Great Friend of Justice Award and heard remarks from Allan Rodgers, who recently retired as executive director of the Massachusetts Law Reform Institute after 41 years there. The MBF has more about the annual meeting and additional pictures of the event.